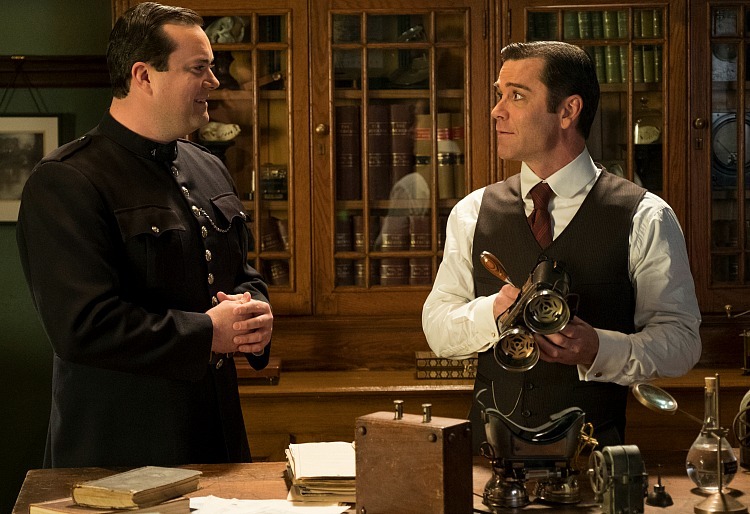 Kristian Bruun says goodbye to Murdoch Mysteries in The Book of Jackson | TV, eh? Spoiler alert! Do not continue reading unless you have watched the Season 10 finale of Murdoch Mysteries. As much as I love Murdoch Mysteries, I didn’t like the way the show said goodbye to Constable “Slugger” Jackson. There was a lot going on in the Season 10 finale and Season 11 premiere, so his loss felt a little shoved to the side for fans. But now I feel like we—and the most lovable lug in Station House No. 4—have gotten a proper sendoff thanks to this season’s Murdoch Mysteries web series The Book of Jackson. Written by Noelle Girard, the six-episode series—available now at CBC.ca—kicks off with the members of Station House No. 4 continuing to grieve the loss of Constable Jackson as they pack up his belongings. But the arrival of a distraught woman looking for the deceased Jackson and the discovery of a hidden notebook filled with a secret code lead Murdoch, Crabtree, Higgins and Watts working to unravel the case Jackson was working on in secret before he died. I spoke to Kristian Bruun about playing Jackson for so many years and what it was like to return to the Murdoch Mysteries set to film The Book of Jackson. I’ve watched The Book of Jackson and it was nice to take the time to really have a heartfelt goodbye for Slugger Jackson. He was taken so suddenly at the end of Season 10, it was hard to really grasp his exit. Kristian Bruun: Yeah, it was nice. At the beginning of Season 11, we’re worried about Murdoch being framed for murder and that Crabtree is OK. They did have a nice little salute to him at the end of the episode that misted me up when I watched it. But it was so nice for me to have the opportunity to put the uniform back on and say goodbye my own way. I was pleasantly surprised and honoured to come back and put the uniform on. What was the production schedule like? When did you film The Book of Jackson? It sounds like it was after Season 10 wrapped. It was sort of similar to how we did the previous year’s web series, Beyond Time, which I was a part of as well. It’s best to film it when the season is up and running when everybody is around, the sets are in order and nothing has been shut down for the winter. Basically, they use the weekends to film the web series, so it’s extremely daunting for the cast and crew that are there all the time because they’ll shoot the regular work week and then will come in on Saturday and Sunday to shoot the web series, followed by another work week. It creates two straight weeks of super-long days. I think we shot this in November, so it was already near the end of the [filming] season and everyone was exhausted. And they fit so much into those two days. I mean, I remember working on the last one and trying to cram so much time travel jargon into my brain. It was such a blast but it’s a whirlwind. So, I came in in November—I’ve been living in Los Angeles for a year now—and at the end of Season 10, we had a feeling one of us was going to die. We filmed the season finale and didn’t know who it was going to be at the time. I wish I’d known it was going to be me at the time because I would have taken the opportunity to say goodbye to the cast and the crew. But, they wanted to figure out what would be best for the fans and the mystery. I wanted to come back because I love the show, but I also understood that logistically I was the one actor who had moved away and that was just a timing thing because of my career and looking for the next thing after Orphan Black. I knew I was on the chopping block but I was hoping it wouldn’t be me. [Laughs.] But that’s the way it goes. I was very sad to get that email from Peter Mitchell. He’s such a funny guy. He was like, ‘You’ll land on your feet, don’t worry.’ He wasn’t worried at all; meanwhile, I’m like, ‘Oh my gosh, what do I do? I had two shows but they just ended at the same time!’ It was stressful, but having the chance to say goodbye this way and see the crew one last time … who knows, maybe this isn’t the last time. Who knows? But it was certainly nice to come back and do some flashbacks with everybody. It must have been emotional to return for those two days after time away and reunite with the cast and crew working that weekend. It’s interesting to hear the circumstances surrounding your departure from Murdoch. I did think perhaps you asked to leave because you were heading to L.A. on the heels of Orphan Black ending. I was sorry that the relationship between Jackson and Watts wasn’t explored more fully before Jackson’s demise. Daniel Maslany and I are good friends now because we’ve gotten to work together and because I’m really, really good friends with his sister, Tatiana, of course. I loved working with Daniel because we just had so much fun together with the dynamic between Jackson and Watts. They are two very different characters, which always makes for good TV. We were just starting to find our stride as those characters and having fun working together. Jackson is a wonderful character. He wears his heart on his sleeve and is fiercely loyal to his friends. They really gave me the opportunity to make him more human. Getting a chance to grow a character is an honour and you don’t always get that chance. Jackson started off as this rival constable from another station way back in Season 5 and grew into another member of the gang. In the memorial to Jackson and the picture up on the wall, they don’t forget him. Watch all six episodes of The Book of Jackson via CBC.ca. Were you happy to see Jackson back in the world of Murdoch Mysteries? Do you have a message for Kristian Bruun? Let me know in the comments below. You were great as jackson it was a great fit with the cast . Hopefully they have you back in some capacity. Good Luck . I wish there were more of these episodes..! He was great on that show. Maybe a flashback or an old plot will bring him back. I was very sad to hear that Jackson had died. He was so lovable and with a possible budding romance…with one of Julia’s student doctors..it’s too bad the writers couldn’t have pursued that Avenue. Always loved the character Jackson and then when Orphan Black started, it was so much fun watching him as Donny. When OB ended, I was like “at least I’ll get to see him in Murdoch” and then boom! They kill off Jackson! It was devastating. It was so great seeing him back in his uniform. Will follow him in all his future projects! Its a shame that the quality of the writers on this show could not see the value of Jackson’s character, makes you wonder what the real reason for his demise was.